Below is a powerful testimony from a nurse (who wished to remain anonymous) about the conditions that she and her workmates face on a daily basis. We need to give full support and solidarity to the action of the INMO and the PNA in the coming weeks. We need a national health services free at the point of use. 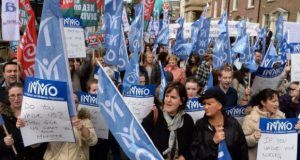 The working conditions in hospitals in Ireland are not safe. It’s not safe for nurses, it’s not safe for patients. Every single day hospitals are extremely understaffed. Sometimes only two staff nurses on a ward caring for patients. There simply are not enough nurses and it is not acceptable. Working conditions are becoming increasingly difficult and dangerous. Do we really want to work in an environment where not only the health and well being of our patients and ourselves are put at risk, but our nursing registration? The nurse to patient ratio in Australia is strictly 1:4. For every four patients there is one nurse caring for them and this workload does not change. 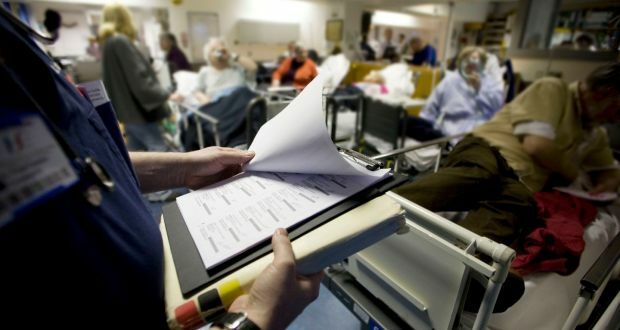 In Ireland on any given day the number of patients under the care of 1 nurse can often exceed 10. That’s 10 patients to asses, wash, dress, toilet, give regular medications, regularly check vital signs, assist with feeding, give intravenous medication, change wound dressings, take bloods, check results, liaise with doctors, physiotherapists, occupational therapists, speech and language therapists, dieticians, social workers, pharmacists, clinical nurse specialists, comfort families, prepare discharges, transfers and admissions, provide pre and post operative care and so on. Now, that’s a lot on its own. But imagine one of those 10 patients is a palliative patient who needs specific end of life care. Imagine another patient has challenging behaviour as a result of dementia and requires 1:1 supervision but there isn’t enough care staff available to provide 1:1 supervision. Imagine one of your patients suddenly deteriorates and requires immediate life-saving interventions. Imagine three of your patients are full nursing care meaning they need a minimum of two staff to assist with all of their daily needs. Your remaining four patients are all due IV antibiotics at ten o’clock, at two o’clock, then again at six o’clock, but the doctors are on the ward round at 10 o’clock and need your input. The dinner comes around at four o’clock and your three full care patients need assistance with feeding, but theatre have just called saying your patient is ready to be collected from the recovery room. At seven o’clock you’re finally getting to sit down to try to finish your documentation when your confused patient falls and hits their head and needs an urgent medical review. After starting your shift at 7.30, it’s now 9pm and you’re finally leaving the ward. Nursing is a four year degree course. We are extremely well trained and educated. We are professionals in what we do. None of us have gone into nursing for the money (obviously). Nursing is still very much a vocation. But imagine facing the physical and emotional challenges that occur every day for us in work, and then not even getting a decent pay for it. We have the same life expenses as everyone else, we deserve adequate pay. The first 3 years of our training is completely unpaid. We complete almost 2,000 hours of unpaid clinical placement as students, often getting up at 5am to work 13 hour shifts (I should also add that without students nurses, the wards would be in even more difficulty). We make less than €15,000 for our internship in our final year. When we graduate our salary is approximately €7,000 less than the other healthcare professionals who work alongside us every day. We are the only members of the healthcare team who work 13 hour shifts. The only ones who work every single public holiday. Why shouldn’t we be paid equally? Why is it dismissed when we ask for pay restoration? Nurses are the backbone of the health system. We are on the wards, in the emergency departments, in the high dependency and intensive care units, in the operating theatres 24 hours a day, seven days a week, 365 days a year. We are not trying to imply that other healthcare professional are less important, they are worth their weight in gold. But so are we. We comfort and support our patients throughout their time in our care. We comfort and support their families. We deal with unimaginable situations every single day. Our patients need us, we want what’s best for them, but we are struggling in the current working conditions. Nurses are completely burnt out. We are overworked, underpaid, physically and emotionally exhausted, stressed and often leave work feeling defeated, wishing we could have done more. We need support. We need more staff. We need pay restoration. Nurses need safer working conditions in order to provide the best possible care for our patients. Give us a reason to stay in Ireland. Give us a reason to continue being nurses. Nurses deserve better, but more importantly our patients deserve better!